Starting this weekend, it's Deer Hunting Season here. Well, as my dad would correct me... it's "Gun Season" (versus Bow Season, which starts earlier... and versus youth season, which was last week). Ya gotta be technical with your terms when your dad is a person some people call "Davy Crockett" as a nickname. Trust me, our friends and family who hunt take special note of how "my" critters are with me. 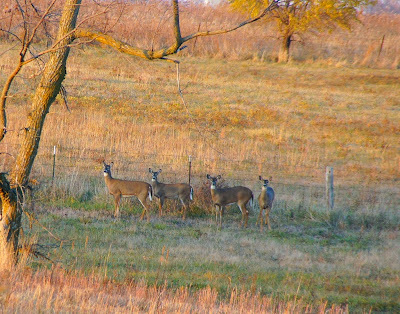 So, when any hunting season comes around, I start getting peppered with questions: "Where are the deer Misty?" "Have you seen any buck, Misty?" "Misty, have you seen a big one?" I just smile and play dumb. I'm not against hunting. In fact, I'm pro-hunting. However, the critters I photograph are "MY Critters". No, I don't own them, but they know me; they've come to expect me walking around them; in a way, they've come to trust me. They're "MY Critters", and, if I can help it, they'll only be shot with a Sony DSLR (doesn't hurt a bit). Deer? What deer? Nope, haven't seen any. A field of gold. These deer are lucky to have you, Misty. Such beauties! I love the gold tones in your shot! Very nice! I hope they continue to get hunted only with cameras. I feel the same way about hunting, Misty. This is a lovely shot with golden light! Deer are such beautiful, graceful creatures. I love watching them and love this photo. Oh, what a lovely sighting! I agree with you here.... I wouldn't give a clue to any hunters who asked me where the critters are! :) We had bow hunters in our parts last weekend, and today pheasant season opened, so there were several pick-up trucks parked nearby very early today. Such a lovely shot with with wonderful light! I am so with you. I have deer in my yard daily. Right now many does and young ones and two small bucks. Not sure if the bucks will survive gun season (yep, know that term)but I hope they will. Such a lovely scene, but maybe I can't look at the scene when hunting is taking place. I hope the hunters change their old traditional consciousness to the save the world now! I know what you mean. I hate that there's a wood just south of me that "my" deer live in and people get to hunt there. I really want to buy the woods just so the animals have a truly safe place. They are so beautiful. I have friends ask me the same questions and I always answer, nope, haven't seen a one. What a beautiful image of the deer - love the light and tones too. The colors are amazing, and not one 'moon' shot. All I seem to get a white tails. Hubby is a hunter, so I've been well-trained on the lingo. His arthritis has kept him from bow hunting this season, but he eagerly awaits gun season. Come Friday, you would think he was 20 years old again. We love "our" deer, too, Misty. Lindy really wants to run with them, but they can leap fences, and she can't. I can't believe I'm late with my Camera Critters this weekend. From a hunting family too. Your deer are even more vulnerable because they've gotten used to humans as non-threatening to some extent. To tell anyone would be a betrayal of the trust you've built. Click on!